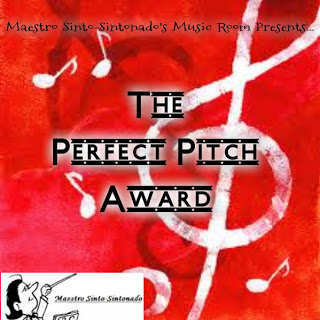 22th and 23th entry to LTGC and Perfect Pitch Award! O come, let us sing of His might and power! He who has the deepest places and the highest mountains in His hands. He who speaks and it is. He who is infinite in wisdom, almighty in power. He who knows everything. He who never permits anything to happen if He doesn’t want it. O come, let us sing of His might and power! That great and mighty God is interested in me, one small individual here on earth. Not just interested, but interested in everything I do, think, am. My heavenly Father knows me, through and through. He knows what I’m going to say, what I’m thinking. He knows my past, my present, my future. He knows my worries, my sorrows, my pain. He knows what makes me glad. He knows more of me than I know myself. He cares for me, He hears my every cry and answers me. He knows what is best for me. He knows me, He made me. Thanks Tabitha Joy and Moises John for these heartwarming letters to God! 1) Please use the same title and include as well the picture above in your post. 2) Don’t forget to link Maestro Sinto-Sintonado's blog to your post. 3) Give the award to 7 other bloggers you love and let them know you gave them this award. 1) What is your own definition of music? Music for me is a sound that makes one dance, to be happy, to be healed emotionally, to make one travel places and to feel in love. 2) Ano ano ang mga genre ng musika ang pinakikinggan mo? I like love songs, Christian songs that brings my soul to the higher ground. 3) Kung ikaw ay isang awit, anong awit ka at bakit? Well, I can't remember any lyrics right now, pero kung ako ay isang awit, gusto ko na ang makikinig sa akin ay ma inspire. Gitara. I bought one and tried to learn how to play it, but now it is just hanging on the wall. 5) Baduy ba para sa iyo ang mga kantang OPM (Original Pinoy Music) considering na isa kang Pinoy? Depende sa kanta. Marami namang magagandang OPM. Iba pa rin ang napapakingan sa sariling wika. 6) Kung may isang stanza ng kanta na magsasabi ng tunay na nararamdaman mo ngayon, ano ang stanza na iyon, saang kanta galing at bakit?
" Jesus take the wheel"
I am tagging everyone who loves music and would love to give an answer to Maestros questions. It is more than a month ago since I left my homecountry, again. I spent three weeks vacation there. I'm so happy tough that I had with me nice memories with my family there, to cherish. Touching moments. Many years ago I left my homecountry to work to Norway. To support my children so that they can acquire an education. And they graduated from elemtary, to high school and college without me being there for them, except when my second daugther graduated in college. And many years had gone by and I now have 6 grandchildren, which is 5 of them goes to school and had many graduations and recognition that I missed. 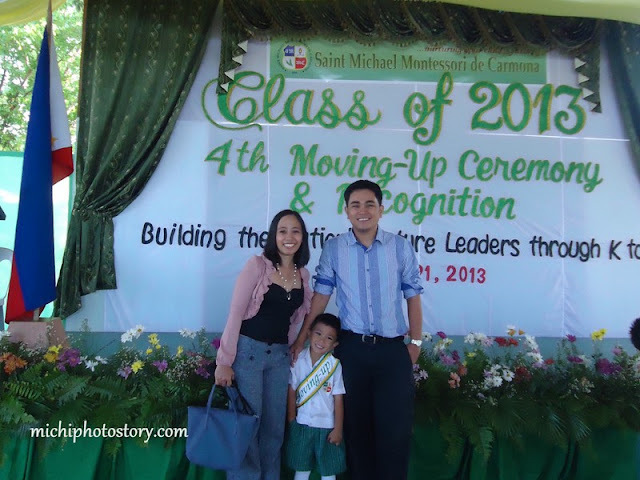 But last March, for the first time I was able to attend the Recognition day and Graduation Day of my four grandchildren. First Graduation day I attended was Zyrish graduation from kindergarten. I was of course invited and she asked me if I can be with her at the stage when she recieved her medals. She got three medals. Her parents was very proud of her and grandma too. The first medal. 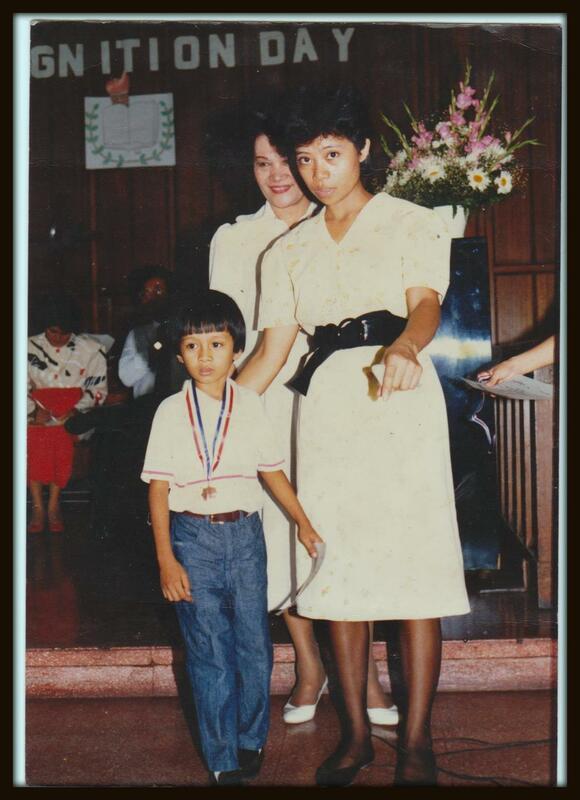 And the second medal with grandma. Zyrish was not smiling anymore. She was already exhausted with the long program. And it was really hot that day! 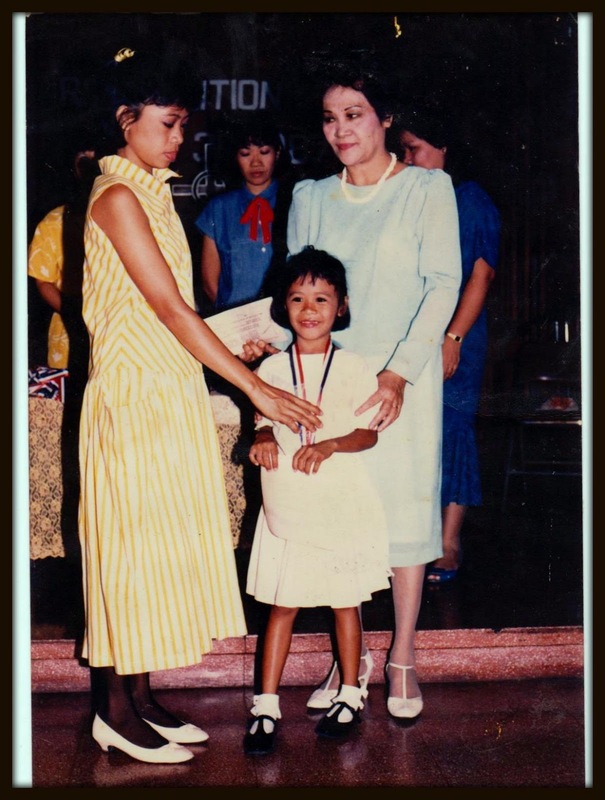 Many years ago, I was present at her mother's Graduation day in Kindregarten too. She was the Valedictorian. Me and my daughter Chelsea. Anyway the day after: Zimon and Candice Recognition day. And this was Zimon and Zyrish mother and me two years before I went to Norway. I was on stage too, together with Candice, my second grandchild and my daughter-in-law. Candice received three medals too like Zyrish. Very talented girls. 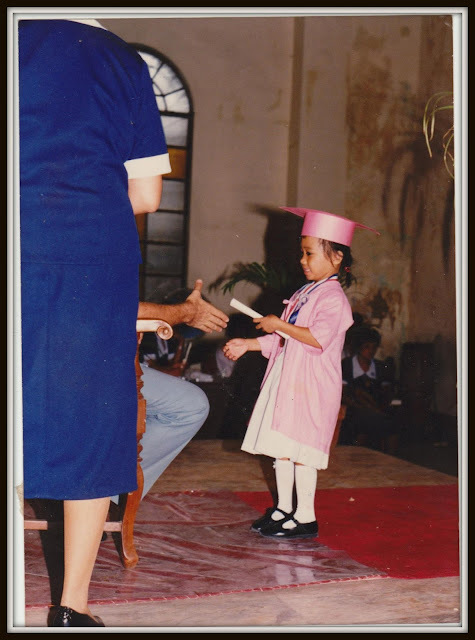 And the best part was to be able to attend Jan Andrie's Graduation Day in Elementary School. My oldest grandson. He graduated one year younger than his classmates. He too has lot of talents. He had won many awards in many fields during his elementary years. Drawing, singing, declamation and art contests. His trophies in different fields. But what touched me most was when he led the graduates in their farewell song. His voice was so clear, strong and beautiful. and when he gave me a rose. ( I studied and finished every level up to college when I came to Norway ) and I didn't witness his father's graduation too. Thanks God, I manage to attend my oldest grandson's graduation. And it was first time for me to witness such an event. It was very precious and unforgettable moment. Me and my one and only son Brian, my Cinderella man. 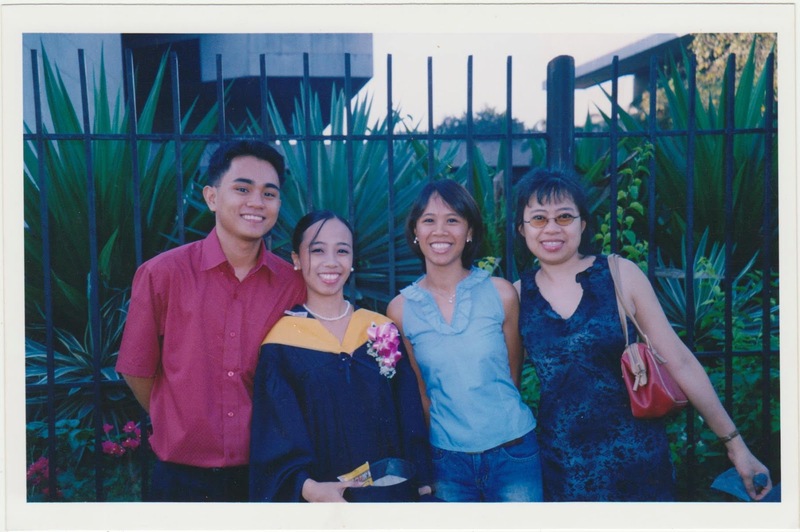 And here we are, many years ago, before I left to work abroad and missed many important moments in their lives. 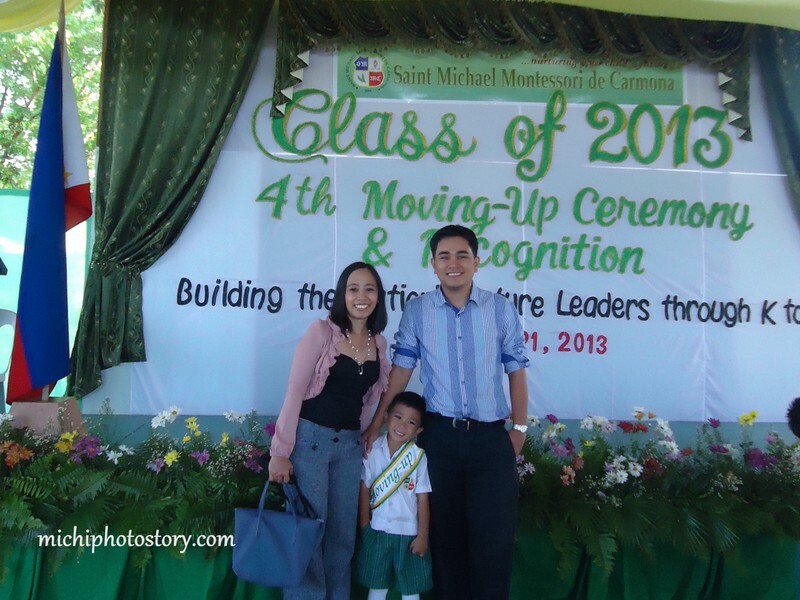 What made me sad though was that I was not able to attend Ethan's moving up at his school. He is my fifth grandson. It was also Jan Andrei's Graduation Day. Ariel, Michelle's husband now, Chelsea, my first daughter and me. Being away from my children in the Philippines most of the time makes these moments unforgettable for me. It brings joy, tears and sadness at the same time. But we made it through the years and we are going to make it in the coming years by the help of God. Feels like ages since I made some cards. So since May month is around the corner and it will be Confirmation month for the 15th year olds, I decided to make a few cards for them. Added some jokes to make you smile! Ronnie Corbett: Do think marriage is a lottery? Ronnie Barker: No. With a lottery you do have a slight chance. Marriage is the chief cause of divorce. In the morning the day after I was married, the phone rang. "Reverse charges call from Jackie," said the operator. "Will you accept the charges?" I couldn't think of anyone that I knew who was called Jackie; so I said no and put down the ‘phone. A moment later, the phone rang again. "Hi, Margaret, it's Jackie," said a familiar voice, "your mother-in-law." A man, his wife and his mother-in-law went on vacation to the Holy Land. While they were there, the mother-in-law passed away. The undertaker told them, "You can have her shipped home for Ł5000, or you can bury her here in the Holy Land for Ł150." The man thought about it and told him he would just have her shipped home. The undertaker asked, "Why would you spend Ł5000 to ship your mother-in-law home, when it would be wonderful to have her buried here and spend only Ł150?" The man replied, "a man died here 2000 years ago, was buried here, and three days later he rose from the dead. I just can't take that chance." A man said his credit card was stolen but he decided not to report it because the thief was spending less than his wife did. At the cocktail party, one woman said to another, "Aren't you wearing your wedding ring on the wrong finger?" The other replied, "Yes, I am, I married the wrong man." A man inserted an 'ad' in the classifieds: "Wife wanted". Next day he received a hundred letters. They all said the same thing: "You can have mine." I married Miss Right. I just didn't know her first name was Always. Losing a wife can be hard. In my case, it was almost impossible. A man meets a genie. The genie tells him he can have whatever he wants, provided that his mother-in-law gets double. The man thinks for a moment and then says, "OK, give me a million dollars and beat me half to death." How do most men define marriage? A very expensive way to get your laundry done free. 21th entry to " Letter To God Contest"
Now for the 21th entry: This from a very talented and promising young man Rix. 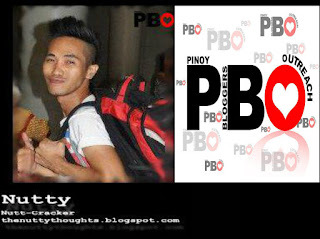 This picture was taken when I met him and other awesome bloggers during my last trip to the Philippines. A very memorable moment. Rix is for me a quiet, humble, funny and talented young man. And here is his very touching entry. Makes one cry. Two months from now, my family will commemorate the day you have taken the life of my mother that she borrowed from You. From the day that we found out what her real condition is, I never stop calling you and ask for you kindness to spare her life as we have many plans for her. When she had the operation, I thought everything will be okay, but it’s not. I know that you always have plans and I know that you are testing our faith in You. You are challenging our trust towards You. I am not a perfect follower and I admit that but you know from the beginning how pure my faith in You and how I trusted You. I am very confident that You're always beside me and you always listen to my voice within. I was really amazed about the teaching of your Son, The Prodigal Son, that even if we turn our back on You, You will still accept us because You are a forgiving Father, and your love and mercy is unconditional. You have truly shown us how you love us when, You have sacrificed the life of Your only son, Jesus, to save us from hell, you let him be crucified in Golgotha and let his blood wash away the sins of the human-kind. From what happened to my mother, I have promised myself to be a good Catholic with the help of my sister, a nun, Your faithful servant inside and outside the church. The congregation of Jesus Good Shepherd collaborated and prayed for my mother. 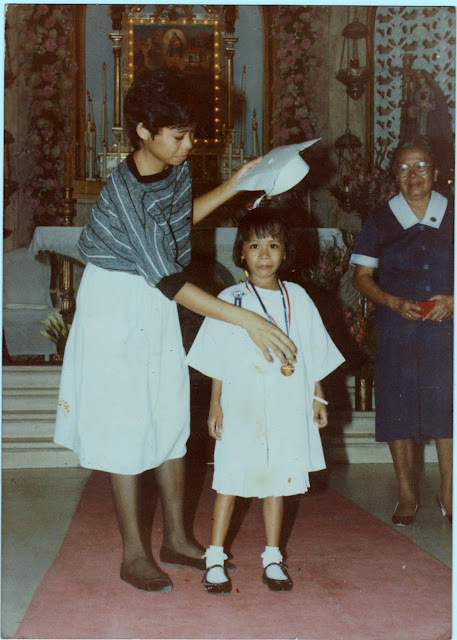 During that time, I believed that she will recover from her illness ‘cause I believed in the power of prayers. However, You did not listen to our prayers. It was pass 11 in the evening, I heard my younger brother shouting, rattled and helpless that my mother is no longer breathing... At that time, I prayed, "Please spare her life. I'm not ready to lose her. I need my mother. She haven't seen how good I am now. She haven't seen how her sons became independent and will be successful in the future. She haven't seen her future grandchildren. I don't want to lose my mother, Lord, please don’t take her life" but you never listened. Together with my younger brother and my father, you let us feel and see my mother lifeless in the hospital bed. My warm tears flows from my eyes, as coldness devour her body, and all I can do is cry in pain and in madness. From that day I never talked to You. I stopped praying. I never communicated to You or believed in You anymore. I even stopped going to church every during Your fest. I have the impression that you intentionally let things happened because we deserve to lose someone in exchange of a not good Christian. I admit, I'm mad at You because you took my mother away from us. It was January, one night, I have a hard time to sleep. I turned-on the TV and scanned the shows. Accidentally, I saw my mother's photo on the table near the TV set. I just realized that everything happens for a reason, we don't know what it is because only You knows why do we need to undergo this experiences. Guilt is eating and swallowing me. This is not what my mother want me to be and to believe in. I know that if she is beside me she will feel upset because of what I am doing. Slowly I have dragged myself to return to You. I started praying again. I started visiting Your home again. My faith is coming back and I am now trusting you again.. Sorry for doubting you but, just like the youngest son in the famous parable, I am coming back to you. Forgive me Father. I believed that You never rejected me and thrown me away. It is me who have left in the love of You. All this time, I felt that You’re just waiting for my return. P.S. Lord regards to my Mama. Tell her I really miss her. I know she’s enjoying the amenities in heaven right now. Please ask her to watch over us and tell her how much I love her. Ma, Advance happy mother's day.. Even if you are not with us, we will still celebrate that day because we never lose you. You are always in our heart. Mwuah. God bless you and good luck Rix! 19th and 20th entry to " Letter To God Contest"
Ang ger@rd ay ang tahanan ng mga saloobin at nilalaman ng isipan ni Gerard Cayco, ang may-akda ng nasabing blogspot. Dito niya isinasaad ang kanyang mga haka-haka, kuro-kuro, ideya, at mga napapansin sa paligid. Ang pangalan ng blogspot ay naging isang palaisipan kay Gerard. Ang unang pangalan nito ay Gerard Legacy, matapos nito'y naging Gerard House of Songs (HOS) dahil nahilig ang may-akda sa pagsulat ng mga awitin hanggang sa dumating ang punto na naisipan nanamang palitan ito ng pangalan at iyon nga ay ang ger@rd. 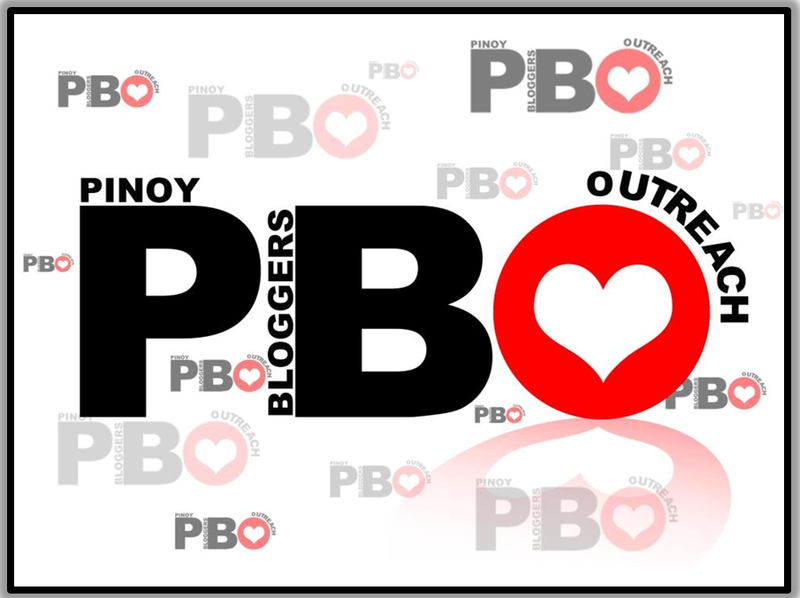 Nagsimula ang blogspot na ito noong November 2010 ngunit ito'y napabayaan ni Gerard subalit ito'y naibalik noong November 2012. There’s never an instance that You failed. The great provider, the soul redeemer, the loving Father! I want more of You, God! Because You are the Lord of all. Here I am Lord! Use me! I want to stay in Your presence. I will always be Yours, forever! I am all bluster- I am not violent. I am not malicious. I am a RESULT. You who have many names, I always asked myself which one of them is true? You have all the knowledge in your hand, but why us people are ignorant? You who sacrificed and saved our lives, but why do we keep turning our backs from your path? With your pure immeasurable love.... Yet we still crave for affection? Those are some of the questions that's running through my mind up until now. It's been a while huh? I missed those days that we were together. Do You still remember the time You taught me how to read your words? It was summer, I think I was 2nd grader that time. I used to go to your House every Sunday just to listen to some of your lines. The story-telling about Your life fascinated me, thinking that no one will never, ever do such thing(s) for I am selfish at that moment and I couldn't see myself sacrificing my own life to save others. I even sang some songs of praises, songs of love and gratitude about You. But that was the time when I was still a seeker. A spiritual-hunger. A "non-believer" if You may say so? After almost 28 years of all fucked up "my-not-so-ordinary-called-life", I considered myself a changed man. A better grown up man. Nurtured by experience. Learned how to water my spiritual garden. A garden of my own. I stopped dropping by at your House every Sunday morning, listening to your stories bored me and noticed that I even forgot to sing your songs? I kept myself from doing that. Doing what other people do. It pisses me seeing them so "holy" outside but totally devious inside. I allowed myself to see and feel a relationship between You and me. With that bond we can hear our voices so clearly. You may think that I already forgotten Your voice, for I became a silent rebel. I even blamed you for all the shits that happened to my life. You let me find all the answers to all of my questions. Doubt clouded me at first but You told me not to. And hell yeah, You know that I had grudges on You but that didn't stopped me to call Your name everytime my life boils on a darker shade of black. Pitch black. For I believe that somehow You will show me a glare of light during my darkest hours. It really amazed me because You never failed to shed some. And I am so thankful for that. Really I am. Blind that I am because I can't see your face, deaf for I can't hear you voice and numb for I can't feel your warmth literally but I know that faith binds our hearts. This time I will never ask questions on You, for you have all the answers right? I admit I am not a perfect son , not even pass your standards but I'm trying.... well atleast I'm still trying? One of the highlights of my recently trip to the Philippines was being with Ethan. My fifth grandchild. He is the son of my second daughter Michelle. To get to know her more, you can visit her website: http://www.michiphotostory.com/ She is the one who introduced me to blogging world. And I got addicted. One day I asked his mother and him to accompany me to the nearest mall where I have to meet a couple to deliver a letter from a friend here in Norway. Since her husband was at work and using their car, we took a jeepney ride. Reminds me of old days. We stopped by in a Jollibee food chain to eat snacks , but he was just interested in playing. Anyway, here is the couple that I was going to meet. He bought eggpies and drinks for us at Goldilocks. After that, he rode a bump car. And wowa and mommy just watched. Then daddy came from work and it was time for dinner. So we went to Paseo. First time for me there. 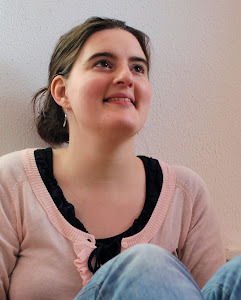 It was a very nice evening, but I only had with me a digital camera and the pictures were not nice. I craved for Philippines cuisines so they brought me here. It was funny though. The word " kanin" means rabbit in Norway. But in the Philippines " kanin" means cooked rice. This place is known for their crispy dinuguan. I just love the crispness of the meat. Being from Bicol region, I missed vegetables cooked in coconut milk. So I ordered "Ginatanan sigarilyas." Crispy and hot! Have to try "Sizzling squids " too. Saying goodbye with this picture. Ethan and I. Miss you Ethan. 18th entry to " Letter To God Contest"
Sixth entry to " Letter to God contest"